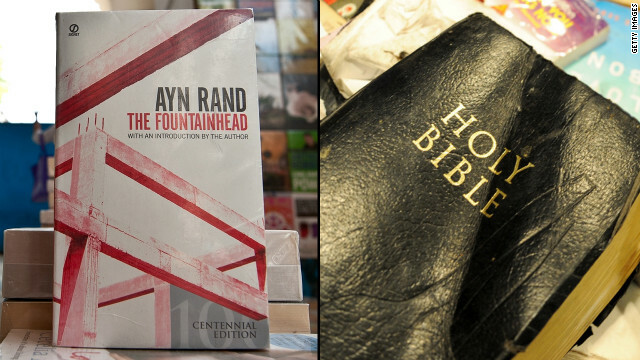 Ayn Rand's book "The Fountainhead" and the Bible. Now that one of the Republican Party’s least ideological men (Mitt Romney) has christened one of the GOP’s most ideological men (Paul Ryan) as his running mate, Ayn Rand is back in the news. Ryan, who used to give away Rand’s novel "Atlas Shrugged" for Christmas, once described this Russian-born preacher of heroic individualism as "the reason I got into public service.” “There is no better place to find the moral case for capitalism and individualism," he told the pro-Rand Atlas Society in 2005, "than through Ayn Rand’s writings and works." Ryan’s religious conservatism obviously distinguishes him from Rand, an atheist who despised efforts by Ronald Reagan and others to marry church and state. And recently Ryan has tried to distance himself from her. Which makes me wonder just how these two influences on Ryan stack up against one another. Is it possible to love Aquinas and Rand at the same time? About as possible as loving God and mammon since Christianity and Randism are, in my view, two competing religions. I know that Rand was an atheist, so it may seem like a stretch to call Randism a religion. But there are plenty of religions (Buddhism, for example) that have rejected God. And like Christianity, Randism has its founder, its scriptures and its miracles (since in the Gospel of Ayn Rand there isn't anything laissez-faire capitalism and its secular saints cannot do). Randism also has its committed devotees, including former Federal Reserve Chairman Alan Greenspan, Supreme Court Justice Clarence Thomas and conservative talk-show hosts Glenn Beck and Rush Limbaugh, not to mention the myriad commenters (see below) who will no doubt object to my efforts to brand her atheism a religion. 1. Jesus preached the virtue of selflessness; Rand wrote a book called "The Virtue of Selfishness" (1964). Altruism is evil, she argued, and egoism the only true ethics. 2. The Apostle Paul called the love of money the root of all evil. Rand wore a dollar sign brooch and saw to it that a florid dollar sign stood guard by her casket at her funeral. She also put a love letter to the almighty dollar on the lips of one of her "Atlas Shrugged" heroes, copper magnate Francisco d’Anconia (a speech Ryan has said he returns to repeatedly when pondering monetary policy). There d’Anconia calls money “the root of all good." 3. “Blessed are the poor,” Jesus says in the Gospel of Luke. And he says in the Gospel of Matthew that “it is easier for a camel to go through the eye of a needle, than for a rich man to enter into the kingdom of God.” In the Gospel according to Ayn Rand, however, it is the “traders” (“job creators” in modern parlance) who like Atlas carry the weight of the world on their shoulders, while the poor are denounced as “moochers” and “looters." 5. The ultimate concern of Christianity is God. The ultimate concern of Randism is the unfettered freedom of the individual. While the Christian Trinity comprise the Father, Son and Holy Spirit, Rand’s Trinity is I, me, mine. For years, Ryan and other conservative Republicans have been trying to have their Jesus Christ and their Ayn Rand, too. But the two clash at least as much as an Obama/Ryan ticket. To his credit, Ryan seems to be acknowledging the gap between Randism and Christianity by attempting in recent months to distance himself from an intellectual mentor and emphasizing instead the Catholic roots of his budget plan. But as Jesus once said, “By your fruits you shall know them” (Matthew 7:16), and I for one still see much more Rand than Jesus in Ryan’s Robin Hood budget. Editor's note: An earlier version of this piece said that Jesus called the love of money the root of all evil. The statement should have been attributed to the Apostle Paul. The reason for trusting in Jesus is he was prophesied, and he did many miracles while on earth, attested to by many folks thereafter. He was and is deity. Other than deity, no one has a lock on good ideas or truthful statements. Whether Obama says it, or Ayn Rand, its still a good idea, or a truthful statement. Do I agree with every Obama or Rand says or believes? Of course not. Do I agree with some or certain things? Of course. Just because I believe Jesus is deity, doesn't mean I can't also think Obama or Rand has a good idea, and follow it. Well put. I'm a Christian but believe it's possible for me to accept the ideas and concepts of someone who is not, even if other aspects of their ideology might clash with my own. I would argue that there are more similarities between Ayn Rand and Jesus than people realize. For example, Jesus said "Give a man a fish, feed him for a day. Teach him how to fish, feed him for a lifetime." This is in-line with Ayn Rand in that teach a person to be self-sufficient and they are more likely to succeed in life rather than just blindly giving. Jesus would not agree with Government giving money to the poor because the money is taken from others to do this. He would instead advocate individuals giving to one another on their own accord. This is exactly in line with Ayn Rand in that if it makes you feel good to give someone something, then she is fine with that. Ayn Rand is closer to Jesus than most people realize. Actually, Jesus did not say that. It is a Chinese proverb. The bible also DOES NOT say God helps those who help themselves. Nice try though on the "I've never read a bible, but I've heard..." approach. Ayn Rand credited Thomas Aquinas with saving the West. I AM NOW TOTALLY CONVINCED THAT A LITTLE LEARNING IS A DANGEROUS THING!! I think you meant Dennis Moore rather than Robin Hood. "Steal from the poor, give to the rich, stupid *itch, stupid *itch. Ryan is one of the Christians of Convenience. The best thing I did in my life was read Ayn Rand and become an Objectivist. 1 Timothy 6:10 says the love of money is the root of all KINDS of evil, not ALL evil. Thanks for correcting; this is almost always mis-quoted! This seems like an important distinction, to be honest, especially in this piece as the author compares the two reverse wordings so closely. Bravo, Jim. You nailed it. Bravo. Jim. You nailed it. Both Ayn Rand and Jesus (if the mofo actually existed) were narcissistic sociopaths. Ayn Rand and Paul Ryan are doing lunch at the Chick-Fil-A. Are you sure they're not doing each other at the Chick-Fill-A? It's nice to think of her cashing her husband's Social Security checks. She must have felt like an utter fool. Why didn't she just create an industry worth billions? Easy according to her books. She (and her husband) paid into that fund for many years (in fact were required by law to do so). "Collecting" it is no different than redeeming shares in a mutual fund or other investment. From 1974 until her death in 1982 Ayn Rand collected a total of $11,000 return of her Social Security investment. The exact figures of how much she paid into it over her long career are not available, but over 35 years-worth is likely to be a substantial amount. Social Security s not an investment. SS pays for current users of SS. Ayn Rand had younger people pay her bills. For what? What did she provide to those people who paid her bills? Nothing more than those unwashed masses she dismissed, and very likely much much less. "All of the posters who express cynicism about "prayer" seem to have a definition of "prayer" that is much different than mine. Their definition seems to define prayer as a sort-of ritual to get "God" to change God's mind on something–that is, to convince God to "do" something that you think needs being done, but you apparently beleive that you need to raise God's awareness of it (which is odd in itself, given that God is omniscient) or you believe that you have to somehow coersce God into realizing how "good" it would be to do your bidding (which again is odd, given that, by definition, God should already know what is good and not need you to remind him). Anyway... prayer is not a technique for aligning God with your desires. It is a technique for aligning your desires with "God's" (however it is you define God, that is). If you pray in this way, you will not be disappointed God, but perhaps occasionally in yourself." Compare Scuramondo's comment versus Jesus' clear, concise and unequivocal statements about prayer.
" If you believe, you will receive whatever you ask for in prayer." Right. Prayer doesn't work, over and over. Nothing ever happens. Matt 21: 21 and Luke 1: 37 ditto on said passages not being said by the historic Jesus. e.g. Professor Ludemann's book referenced above. And all of John's Gospel is of questionable historic value. "Since "the higher criticism" of the 19th century, some historians have largely rejected the gospel of John as a reliable source of information about the historical Jesus. "[M]ost commentators regard the work as anonymous," and date it to 90-100." "The authorship has been disputed since at least the second century, with mainstream Christianity believing that the author is John the Apostle, son of Zebedee. Modern experts usually consider the author to be an unknown non-eyewitness, though many apologetic Christian scholars still hold to the conservative Johannine view that ascribes authorship to John the Apostle." "Anyone looking for the historical Jesus will not find him in the Gospel of John. " The author brings up some good points, but he seems to be saying that conservatives are not charitable enough to the poor, and this needs some clarification. Conservatives are actually more charitable than liberals, even when adjusting for income (google it if you don't believe). But these days there are too many people on the dole that are just plain freeloaders, and conservatives believe that able-bodied people should work for their living whenever possible. Giving more handouts to them is not only unnecessary, but denies them the hope of leading a fulfilling, proud existence. churches have to freeload.. why... there are many large churches in the south that with the tax payer would not survive. Well, that's one thing that is interesting about most main-stream Christians. "Blessed are the poor, for theirs is the kingdom of heaven" is not how that scripture should read. Honestly, being poor does not make you blessed. Improper Bible translations have led people to misinterpret all kinds of things about Christianity. So much that many feel all they have to do is say they accept the Lord and they are saved. Unfortunately, that is silly. And all the Atheists know it. But when you understand that you also have to be good, keep his commandments, repent and serve others, suddenly it isn't silly. Try this translation of the Bible: "Blessed are the poor in spirit, who come unto me, for theirs is the kingdom of heaven." Now, it is not silly, it actually makes sense to believe in Christ. Changing the words of the Bible DOES make it better! I'm going to change all the words in my Bible right away! I don't agree with Ayn Rand, but that's not to say that some principles she has are not admirable. For instance the idea that every one has unfettered freedom is shared by all of our forefathers, federalist and anti-federalist alike. Each person should be free and responsible to do as they see fit. When those decisions cause a confliction with another's freedom, health, or prosperity, then and only then, should they yield. Ayn takes that a step farther and feels that its fine to trample others for one's own prosperity, because if they allow themselves to be trampled, they were not deserving of their position. More complete misunderstanding of what objectivism really means. If you look at history, all great achievements have occurred because one extremely talented individual pursued their ideas to the total exclusion of all else. As a result, all of humanity benefited from their achievement. So, if the truly talented are chained to the untalented or mediocre, they will never make the big breakthrough that advances all of humanity. As such, collectivism, altruism, et. al. are truly evil in that all of mankind is held back when the truly talented are prevented from obsessive pursuit of their goals. This is indisputable. Where Ayn Rand made (I believe) a huge mistake, was equating talent with financial success. In both The Fountainhead, and Atlas Shrugged, the heros were not concerned with riches, just with excellence. They rightly felt that the rewards for their excellence should not be taken from them and shared with the undeserving, but the point was not to make money, it was to perform to the limit of their abilities. Later in life, Ms. Rand fell into a trap of worshipping the dollar as the only legitimate indicator of talent, and I think she completely betrayed her own philosophy in doing so. Ayn Rand failed to be grateful to the countless individuals that came before her and made it possible for her to be the person she was-from the hunter-gatherers who cultivated language that she used to communicate her ideas and mastered agriculture that made food more readily available to people so they could pursue academic pursuits- to the people who invented paper and printing presses etc. What about the ones who built the schools she attended, not counting the people who taught her-or the people who built the roads so she could get to school. Individualism is an illusion. We are all in this together. If the non-excellent disappeared from the face of the Earth, the excellent would be screwed.
" If you look at history, all great achievements have occurred because one extremely talented individual pursued their ideas to the total exclusion of all else." And you actually BELIEVE this? Who invented the railroad, for example? Or the steam engine? Watt built nice cheap ones, but he didn't invent them. Most progress comes from teams working on multiple lines of research. One guy has an idea and 25 more hammer it into shape. You think Cheops built that pyramid himself? History is written (or rewritten) by the dudes who want the credit, or the spoils. Unselfish people don't get credit for as many historical advances as selfish people because unselfish people don't seek the credit. Selfish people take credit for other people's work and also start wars to take more. Only selfish people see selfishness as a virtue, and selfish people congregate together to lie to each other about their accomplishments. The tangible proof of their baloney is money which draws sycophants who stroke their egos, and the cycle gets worse. But these are not the people who advance history for the better. These are just the people who figured out how to make the most money. I simply can't believe that Ayn Rand is still taken seriously in this world; her glorification of narcissism, her complete rejection of the obvious interdependence that humans need to thrive as a species, and the obvious inattention to the "externalities" (consequences) of our actions that affect others are each, alone, reason to utterly reject her philosophy. Rand's only true value is that she provides a litmus test in identifying adherents as narcissistic sociopaths. Jesus would utterly destroy Ayn Rand in debate. You have missed Jesus' message entirely, just as 99.9% of the self-described "Christians" have missed the points of Jesus' message. Jesus' message was exactly the same as Ayn Rand. The onyl difference is that Jesus, and the authors of the Old and New Testaments, had a different language, used a different imagery, to express the same values and principles. Jesus would not disagree with Rand. e would agree. Oh, there may be some different points of view at the edges. But that is it. Let's see, how do I persudae you? John 1:1, describing God's character: Int eh beinning was the qword, the word was with God and God was the Word. The Greek term for "word" is "logo" – logic, reason. Jesus invited us to turn the other cheek, not to cast the first stone, to exmine the plank in our own eyes before criticizing the spec in the eyes of others. Any clue as to the intent of that message? Jesus is inviting us to use the reasoning part of our minds, to set aside all of the primitive instincts, the impulses, the herding instincts, the fear, all of the passions, to use, as Ayn Rand would tell us, our reason to identify a set of "objective" facts. Ayn Rand was against religion ash she should be. Religion is committed to something other than identifying objective facts to guide or manage our relationships with onme another. Religion is into the mystical, the magical, belief which is lead by primitive survival instincts. You would probably not know that because what we call "Christianity" today is the product of many very evil influences, expecially the narcissism which ascribe to Rand. yes, there is that in Rand, but it exists in equal measure in "Christianity". I can see it in you. In my estimation narcissism is the real evikl in the world. I think that Satan, himself, was the first narcissist. Had the authors of the Bible had the current language and imagery which we use today, they would have described Satan as the first narcissist. Satan's problme, you see, was in believing that he did not have to comply with the rules. That, dude, is the essence of naricssism. Jesus asked us to be "born again" into a higher nature, to set aside the primitive impulses which would make us, just because the herd promotes it, to cast stones at one another. The other evil by the way, are herds. Jesus himself did not align himself with herds. He knew their nature. The herd murdered him. The herd will murder him again and again. The 99.9% will turn to the anti-Christ because they are looking for the protection and comfort which is provided them in the middle of the herd, as it gets ever closer to the edge of the abyss. She has an extreme position, which was largely a product of her era - the 1940's had punitive (and almost confiscatory) 94% tax rates for the wealthy. And the post stock-market crash brought a lot of government policy restricting enterprise. However, there are extreme positions on the left, too People get inspiration from extremes. The central messages of Rand is that everyone is morally obligated to be as self-sufficient as they can be, and that the natural and correct way of the world is that people reap rewards for their achievements. She also believed that people should pursue rationalism instead of faith. These are all reasonable values for a person to have, even if Rand's anger and bitterness make them unpalatable. Of course, if she weren't an extremist, nobody would have paid attention to her. That's what fame is like. really -Jesus would destroy Ayn Rand in a debate?-– "Jesus" has no record of attending any school and was likely illiterate, not to mention the 2000+ yrs of science, mathematics, economics, philosophy, and human advancements and facts that have been amassed since the 1st century that Ayn was privy to...so I doubt it. Also, just curious– if "God" already knows everything, then is he then incapable of learning? the flaw in your logic is that you presuppose that if one knows everything they can't learn something new. of course knowing everything doesn't mean that you cannot learn something new. even if it did your only point would be that god couldn't learn something, not that there is or isn't a god. "Let's see, how do I persudae you?" And then a cascade of lame Bible stuff. Man, I hate people who think they are going to persuade us, especially when they type too fast. We know there's a Bible, son. We just don't believe in it, same as you with the Quran. Get over it. To call Rand's philosophy a religion is intellectually dishonest. Rand rejected faith and provided observable facts to validate her system. Unlike religion, which is accepted contrary to rational evidence, Rand's philosophy can be proven to anyone who spends the time to study it honestly. Hi Brian, You're understandably wrong due to having a basic misunderstanding on what a religion is. Religions are not always focused on the supernatural (as with Buddhiism and Daosim) but on philosophical precepts of which the followers of Ayn Rand do so with gusto. The dictionary is a pretty good definer of what religion is and like Buddhism and Daoism (not the only religions that are philosophical in nature by any means), "Randism" is certainly a religion when one adopts the philosophy and practice with ardor and faith in the outcome. Rand's philosophy is far from "proven" except in the singlularly philosphical point that people are self-centered and that erality is independent of consciousness. Her precept that the greatest moral good is your own selfish happiness is childish and reflects the maturity level of a teenager and we see how this idea has become the moral center of American society already and look at the disasterous results. We have hundreds of millions of people seeking nothing but their own happiness and hurting others in the process. We have a society of happy people (happiness is temporary and fleeting) who are miserable and "in need" of drugs to keep them from violence, depression and suicide. Moral objectivism is a failure and we all see it. Her philosophy results in social Darwinism of the strongest surviving and preying on the weakest. That is not full humanity (and we know that because we all know that it is wrong and admit to it being wrong) but is a degrading of humanity by making us no better than an animal with no sense of right and wrong which we know exists. The premise of Ayn Rands philosophy is this- If an individual pursues "their" gifts unabashedly & with true diligence they will in effect help the general populace. If an individual with "gifts" were to sacrifice their "gifts" because others did not possess such gifts, guilt or to pursue a flawed path of make believe altruism then they are hurting society in the long run. If you read her work with an open mind you will see that she encourages people to pursue their "gifts" because it is "their" calling. If you become "ALL YOU CAN BE', you will in effect help others. You make Ayn Rand seem just like...Joel Osteen! I'm just kidding. I don't know enough about either Rand or Osteen to be critical or supportive. I love your comment! Whether right or wrong (I'm not complete in my info on either myself) it is the most enjoyable thing said in these commentaries among all these stuffed shirts hell-bent on their POV being the right one for everybody. "Her philosophy results in social Darwinism of the strongest surviving and preying on the weakest. " That's it exactly, except that she wants to pretend that rich people are the weak ones. with reason. "to think or not to think"?